Past earthquakes experience regarding frame structures with slender braces, i.e. tension-only concentrically braced frames, has demonstrated poor seismic behavior of these systems. In these buildings, the bracing system does not have sufficient buckling strength, and the sudden buckling causes rapid drops in the structural stiffness and strength. In the present study, to improve the seismic performance of slender braces in frame structures, adding new, replaceable shear-flexural yielding hinges in the central yielding dampers is proposed. In the new system, by transforming the axial force of braces to shear force and flexural moment in the hinges, the seismic energy will be dissipated. 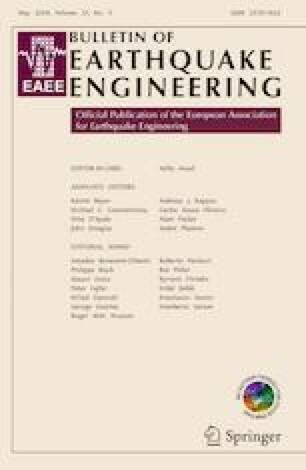 In this regard, the influences of the proposed dampers on the seismic response, as well as response modification factor (R-factor), are evaluated along with the seismic reliability analysis for different performance levels. The results show that the proposed damper has an acceptable energy dissipation capacity and considerably increases ductility of the system. The response modification factor and corresponding acceleration for the frame structures equipped with the new damper are derived as 8.5 and 0.775 g, respectively. Also, it is observed that the proposed energy-absorbing system provides acceptable reliability, such that the bracing system remains in the immediate occupancy performance level in the case of design earthquake level.